Admittedly for me, this type of shot is one I always struggle with when it comes to post processing and trying to make the image reflect the original scene. 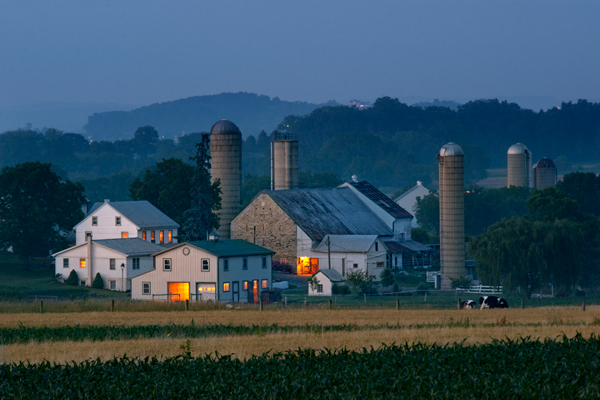 I was heading home after an evening of shooting and this scene across the valley caught my eye. A light fog had started to settle in and the farmer was doing late day chores,so the contrast of the cool evening and warm interior beckoned me to stop. I shot this with about 300-400mm and I was on my truck roof with shutter speeds ranging from half a second to 2 seconds. It was a lot darker than my image appears here but making it dark never seems to print right or look right to my eye. I am surprised the cows are so sharp. This entry was posted in Landscape, Photography, Sunset. Bookmark the permalink. Don, I really like this. Hope you had a good 4th. Thanks Gary. Didnt do a darn thing all day,and I guess that beats working. Is this a recent shot, it reminds me of one yuo sent before…cool stuff!